Referred to as ‘Golden Apple’ in the Indian subcontinent, Lemon is a universal remedy for many health disorders and is often called as a panacea for its ability to heal the mind and the body in manifold ways. 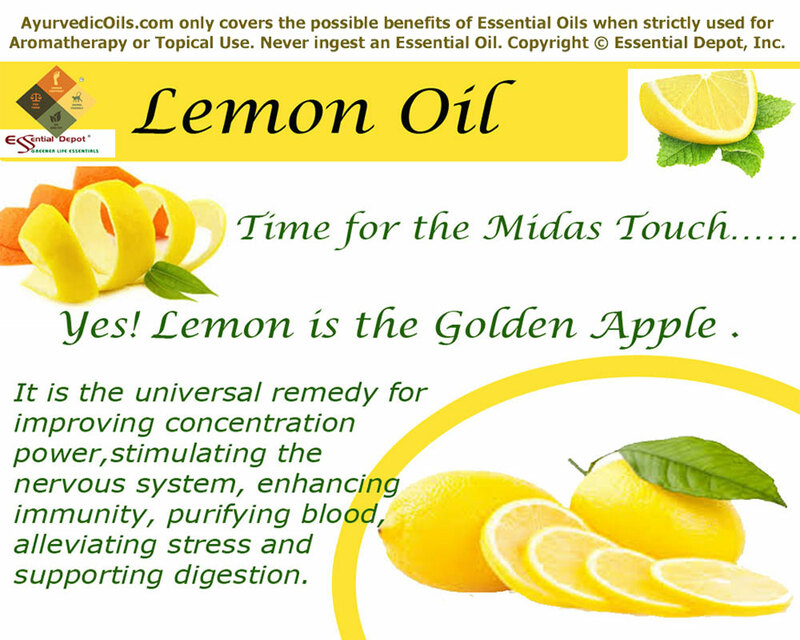 The essential oil of Lemon is cold pressed from the external rind or peel of the Lemon fruits. The real origin of Lemon lies as a mystery and it is said that Lemon is indigenous to India, Myanmar and China. The first historical mark of Lemon was in 90 BC where it was used to shower a high priest in a festival of Jews in Jerusalem though certain sources say that Lemon has been used since 800 BC. It was introduced to Europe in the 1st century AD during the Roman reign and slowly spread to other parts of the world like Persia, Egypt and Iraq. It is also said that Lemon was grown as an ornamental plant in the primordial Islamic gardens. Affluent Victorians grew Lemon trees in their gardens as a symbol of high regard and for garlanding their estates with the naturally refreshing aroma of citrus trees. Serving Lemon wedges along with tea during their tea dances in the afternoon was a popular custom in their tradition. It was Christopher Columbus who introduced Lemon to America by bringing Lemon seeds to the Island of Haiti during his voyages in 1493. Botanically known as Citrus limon, Lemon is a hybrid of citron and sour orange. The most notable use of Lemon in the history was its use as a promising protection against scurvy by sailors all over the world. This was endorsed by James Lind, the celebrated Naval Surgeon in his book ‘Treatise on Scurvy’. According to the Gas chromatography report, Lemon oil constitutes of 5 major chemical components that contribute to its fresh citrusy fragrance, remedial values and distinct quality. Lemon oil is enriched with about 67.6 percent of Limonene constituent. For knowing more about the elite information of these top constituents of Lemon essential oil. 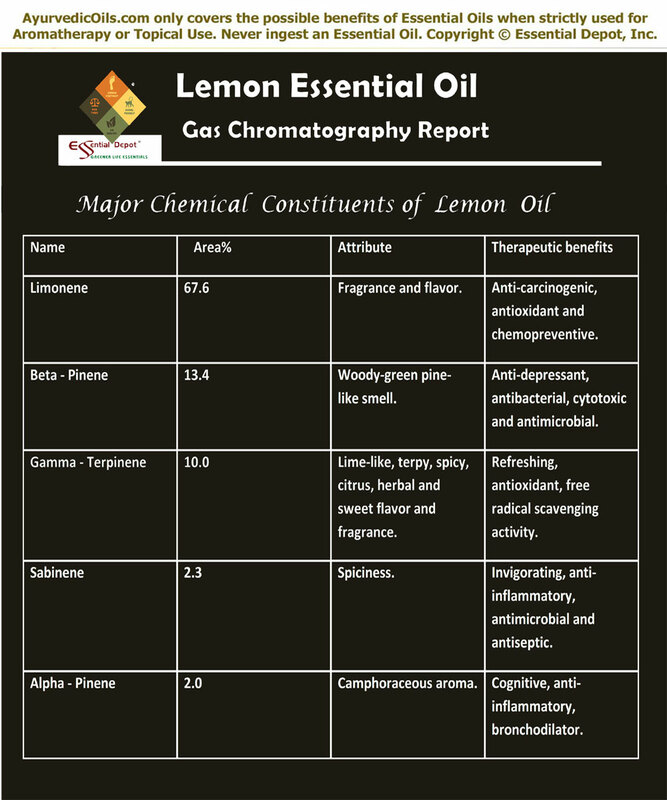 The table below on the Gas Chromatography report talks about the primary chemical constituents and its role in granting the therapeutic values and other attributes to Lemon essential oil. The remedial properties of Lemon essential oil are antiviral, antibacterial, immune stimulant, digestive, anticancer, anti-inflammatory, calming, diuretic, expectorant, astringent, anti-anemic, detoxifying, antioxidant, tonic and antidepressant. Ayurvedic healing dates back to more than 5000 years and it is the oldest of all medicinal systems on earth. 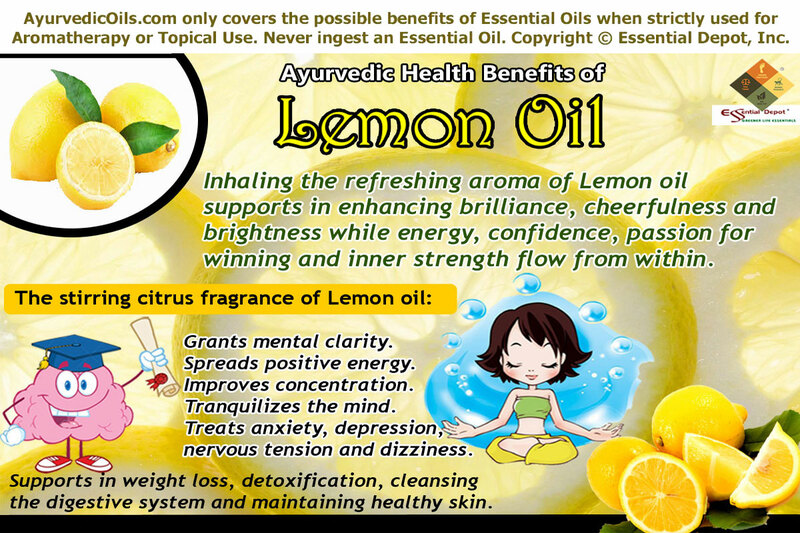 Lemon has been an important part of Ayurvedic treatments in many forms. The top ways to start a refreshing Ayurvedic life begins with the use of Lemon in lukewarm water as this therapy is said to cleanse the system, clear impurities in the blood and energize the mind and the body. Human being is a unique creation and Ayurveda adorns the beauty of an individual constitution that differentiates each and every individual with a unique physical and mental setup. This uniqueness is determined by the combination of the three biological energies known as doshas. They are vata, pitta and kapha. Vata dosha is responsible for blood circulation, creative thinking, metabolic functions and the process of elimination. Pitta energy governs body temperature, digestive fire, leadership skills and perfection. Kapha dosha lies behind the movement of fluids in the body, love and affection and body mass. Predominance of any one of these doshas determines character, personality and behavioral attributes. Dosha balance contributes to good health and imbalance of doshas indicates illness. Ayurveda sticks to nature and trusts that natural remedies are the best ways of healing human beings as they are an incredible part of nature. Ayurvedic therapies are unique for every individual and are focused towards treating dosha imbalances. Ayurvedic remedies are often aimed at treating the five senses of human body. They are the sense of sight, sense of smell, sense of taste, sense of touch and sense of sound. Lemon is by far the best Ayurvedic remedy that has the power to retreat and recharge the four vital senses of the human body. Lemon and its essential oil is said to pacify kapha and vata energy and aggravate pitta dosha. The very sight of Lemon gives energy, confidence and inner strength. This is because the bright yellow color of Lemon indicates brilliance, cheerfulness, brightness and sunshine. These are the symbols of potency and real power paving way for improvement in one’s health physically and mentally. Healing through the sense of sight is known as color therapy in Ayurveda. This holistic healing methodology states that every color has various impacts on the physiological and psychological attributes of mankind. Yellow color of Lemon and its essential oil according to Ayurveda has the power to promote clarity of mind, grants motivation, enhances the energy level, augments communication and instills the power of winning. So the next time, when you are feeling down and depressed, just look at the ‘Golden apple’ (lemon) that has the power to mend your mind to peace and prosperity. Aroma plays a vital role in uplifting the body and mind. By inhaling the aroma of Lemon essential oil, the therapeutic molecules in the oil reach the limbic system of the brain through the nasal passages, where limbic system is the body’s control center that controls feelings, emotions and the corresponding behaviors. The citrusy, fresh, energizing and enlivening aroma of Lemon essential oil spreads positive energy, calms the mind, grants mental clarity, treats anxiety, fatigue, nervous tension, dizziness, improves concentration, instills hopefulness and assists in weight loss when 2 drops of this oil is added to aromatic lamps, diffuser, air freshener, vaporizer or burner. A 2004 study published in Brain Research stated that Lemon essential oil may contain pain-relieving and anxiety-reducing properties. When used in steam inhalation, Lemon oil aids in opening blocked nasal passages and clear chest congestion. The revivifying fragrance of Lemon oil makes it a favorite flavor in household cleaners, disinfectants, soaps, shampoos and detergents. The best way to take Lemon internally is to drink the fresh juice. Ayurvedic therapies like Chardi Nivarana and Kaphotlesha suggests drinking lemon juice during nausea, vomiting, excessive salivation, gastritis, heaviness in the stomach and sluggish bowel movements. This helps in eliminating the excess deposits of kapha in the stomach. Lemon is also called as Amadoshahara where ama is the toxic substances in the body. Drinking lemon juice is a proven Ayurvedic remedy for eliminating ama, which is a result of indigestion and improper absorption of nutrients. Drinking lemon juice mixed with warm water and honey in the morning in empty stomach is said to treat obesity by stimulating the bowel movements and burning the excess fat deposits in the body. Lime has diuretic properties and it helps in expelling the excess fluids in the body causing obesity through urine and sweat. Ayurvedic massaging or Abhyanga is an important therapy in Ayurveda for healing numerous illnesses and for eliminating the toxic substances from the body. Abhyanga is the art of maneuvering the body with hands, legs, elbows and certain other massaging equipments. The success of an Ayurvedic massage therapy lies in choosing the right massaging technique along with right essential oils that suits your health condition and unique individual constitution. Treating through the sense of touch means using essential oils and herbal medications on the skin as skin is the best organ through which the therapeutic properties of these natural remedies penetrate deeply into the bloodstream. Lemon oil is an excellent remedy for treating skin problems like acne, rough skin, dull skin, oily skin, wounds, pigmentation, cold sores, cellulites, warts, varicose veins and sun tan. The antiseptic, disinfectant, astringent, antiviral and soothing properties of this oil assist in rejuvenating and toning the skin naturally by improving blood circulation. Skin care specialist Lia Schorr says that using Lemon oil mixed with glycerin can assist in treating rough patches on the knee, feet, hands and elbows. Blend 2 drops of Lemon oil with 15 drops of Jojoba oil and apply it topically on pimples, boils, pustules, blackheads and whiteheads. It helps in removing excess oil, eliminate impurities in the skin and clears acne on regular use. You can also apply this blend on cold sores, tanned skin, dull skin and rough skin. (ii) As Ayurvedic massage oil: Gently massaging your abdomen with 3 drops of Lemon oil mixed with 20 to 25 drops of coconut can help in treating dysentery, intestinal parasites, gas, flatulence, nausea, food poisoning, stomach upset, acidity, cramps and heartburn. Massaging your chest, throat, foot soles and back with this blend can assist in treating throat infections, tonsillitis, fever, flu, cough and cold. The disinfectant, antiviral and expectorant properties of Lemon oil aid in controlling the growth of viruses responsible for cold, arrests infections and helps expel phlegm and mucous deposits in the body. This is due to the kapha pacifying property of Lemon essential oil. Gently massaging your scalp with 3 drops of Lemon oil blended with Almond oil can help in controlling dandruff, moisturize the scalp, and augment the strength, volume and shine of your hair with its tonic and stimulating properties. (iii) As bath oil: 3 to 4 drops of Lemon essential oil added to warm bathing water helps in relaxing your muscles, alleviate stress, lessen depression, promote good sleep, induce peace of mind, wipe away negative feelings, enhance skin health, detoxify the body, cleanse the digestive system and treat respiratory ailments. (iv) As cold or warm compress: Few drops of Lemon essential oil added to cold or warm compress can help treating acne scars, pain, inflammation, headache, fever, congestion and stomach ache. Healing through the sense of sound means listening to appeasing music and reciting mantras and slogans that would enrich one’s spiritual values. Add 2 drops of Lemon essential oil to your vaporizer, burner or diffuser during your meditation time or while practicing yoga with the background of soothing instrumental music. This is a simple and an effective remedy for staying refreshed, uplifted and re-energized throughout the day. Inhaling the invigorating aroma of Lemon essential oil during prayers, chanting mantras or reciting holy books can augment your oneness with the Divine power and pacify your mind and aura simultaneously. Feeling down? Then it’s not a bad idea to listen to motivational tapes with the company of the magical Lemon aroma around you. Add 1 drop of Lemon essential oil to your hanky or wear it on your wrist and you’ll be amazed to see the energy flow from within along with the motivational speech. Never use essential oils internally as pure essential oils are highly concentrated in nature. Dilute it in suitable carrier oils before using them externally. Do not go out in sun as soon as using Lemon oil because this oil has phototoxic effect just like other citrus essential oils and can harm your skin due to the exposure to ultra violet rays. This article is for educational purpose only and is not intended to replace any expert advice or prescribed medicines. Consult your Ayurvedic practitioner before using the appropriate essential oils for your unique constitution and health condition. The MSDS (Material Safety Data Sheet) of Lemon oil is readily available for your enhanced safety and healthier usage. 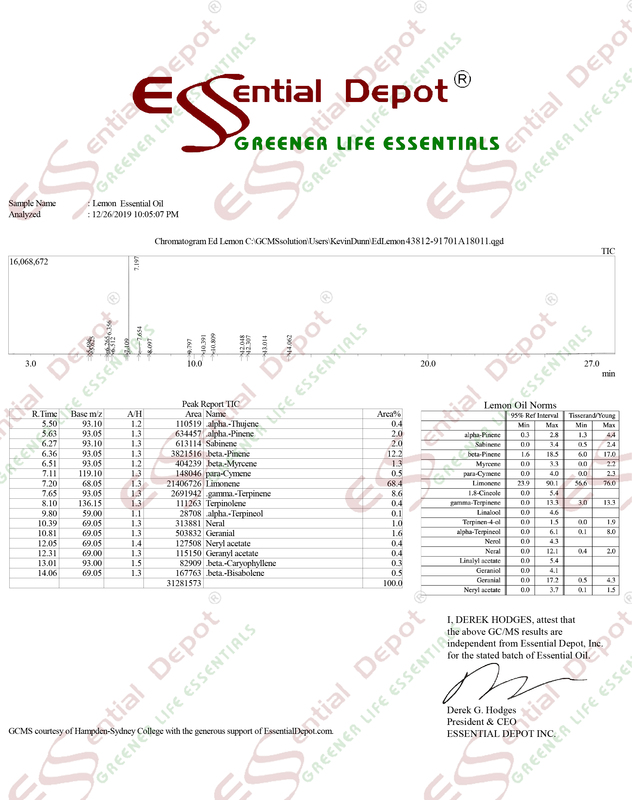 Gas Chromatography Report of Lemon essential oil. Lemon essential oil is witnessed as one among the photosensitizing citrus oils that may cause burning sensation, irritation, hyperpigmentation (discoloration of the skin surface) and other changes due to its effect of stimulating the photosensitivity of the skin, when exposed to visible light from the sun up to 12 hours of use. The primary reason is the reaction of the photoactive chemical components that absorbs light and leads to toxicity via molecular alterations in the skin. On a lighter note, Furocoumarins are also used in remedial practices along with the long-wave ultraviolet light therapy for curing psoriasis, mycosis fungoides and vitiligo. This entry was posted in Essential Oils - Learn About and Purchase and tagged Adverse effects of Lemon oil, Ayurvedic health benefits of Lemon essential oil, Ayurvedic oils for acne, Ayurvedic oils for cold, Ayurvedic oils for concentration, Ayurvedic oils for depression, Ayurvedic oils for hair care, Ayurvedic oils for obesity, Ayurvedic oils for skin care, Ayurvedic remedies for dandruff, Ayurvedic remedies for digestive disorders, Ayurvedic remedies for insomnia, Ayurvedic remedies for weight loss, Chemical constituents of Lemon essential oil, Gas Chromatography Report of Lemon essential oil, Greener life Diamond Bio-Healthy Score of Lemon oil, Health benefits of Lemon essential oil, Lemon in Ayurveda, MSDS of Lemon essential oil, Possible skin issues of Lemon oil, Therapeutic properties of Lemon essential oil by AyurvedicOils. Bookmark the permalink.